The past: It is Feudal era Japan, the Muromachi period (1337-1573). The Daimyo Ashikaga Yuu has grown in power thanks to his samurai warrior, Tatsuo Takeshi. However, he has grown to fear his soldier’s power and suspect his loyalty. Due to this paranoia, Ashikaga deploys a small army of soldiers to ambush him. Tatsuo spends the day slaughtering the soldiers, but as he fatigues, one of the soldiers manages to strike him with his blade, chopping off Tatsuo’s right leg at the knee. Tatsuo kills the remaining soldiers, but collapses. 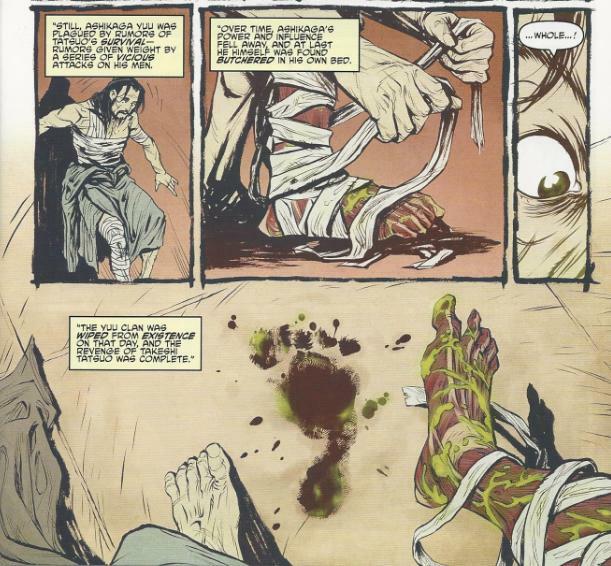 As he passes out from blood-loss, he is taken away by a mysterious, shrouded person. 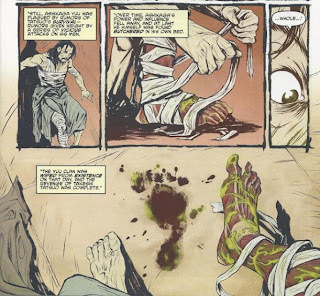 Tatsuo awakens later to find that his leg has grown back (though covered in a strange green ooze) and is inspired by the bloody footprint he leaves behind. The present: Dr. Patrick Miller relates the story of Tatsuo Takeshi to an auditorium of fascinated guests. Among them is April, Casey and the Turtles (who are hiding in the rafters). Apparently, after Tatsuo was presumed killed in the ambush, the entire Ashikaga clan, including the Daimyo, were slaughtered by an unknown force. Dr. Miller tells his guests that recently he stumbled across a hidden temple in Japan and found pages from a book titled “The Secret of the Foot”. The pages relate the history of the Foot Clan; a political force during the Feudal Era. More importantly, though, the pages appear to have been authored by Tatsuo Takeshi years after his supposed death. April, Casey and the Turtles suddenly become VERY interested in the lecture. According to the pages, Tatsuo allied himself with a Kitsune witch in servitude to a being called the Iron Demon. Tatsuo became more monstrous during this second life, carrying out the Iron Demon’s commands to ruthlessly slaughter the innocent. The Past: The Foot Clan burn a village to the ground. Two Foot Soldiers, Masato and Oroku Maji, are shamed by their actions as they witness women and children flee in terror. Oroku Maji wishes to be free of their psychotic leader, but all of the Foot Clan fear that the stories of his unholy alliance may be true. The three soldiers witness the Kitsune (in the form of a three-tailed fox) racing across the burning rooftops and follow her. They spy on a meeting between her and Tatsuo (who has finished slaying the infirm Lord Daisuke). Tatsuo tells the Kitsune (now transformed into a woman) that he has taken the land their master has demanded. The Present: Leaving the lecture, April insists that she and Casey try to get some more info on the Foot Clan from Dr. Miller. Casey is suspicious of the guy, but has nothing better to go on than his gut. Piling into April’s van, they find the Turtles already waiting. Leo says that they should try to learn what Dr. Miller knows. Back inside, Dr. Miller is stopped by Karai (dressed in a business suit). Karai tells Dr. Miller that she represents a private party who has acquired more pages of the “Secret of the Foot” and would very much like him to take a look. Karai leaves Dr. Miller her card. Back at lair, Splinter fills in the rest of the blanks regarding Tatsuo Takeshi and his last days as leader of the Foot Clan. The Past: The Kitsune travels back to Tatsuo’s castle, carrying a strange burden. Oroku Maji and Masato call a secret meeting of the Foot Soldiers who wish to overthrow their brutal leader. Oroku Maji says that every full moon, Tatsuo locks himself away while the Kitsune fetches him something. They believe whatever the Kitsune delivers to Tatsuo is the source of his unnaturally long life and inhuman strength in battle. As the next full moon arrives, the Kitstune delivers her burden to the elderly and bedridden Tatsuo: a bowl of ooze. Tatsuo drinks the ooze and is restored to his youth and strength, though he finds being the servant of the Iron Demon a distasteful fate. The Kitsune promises him that she is searching for a means to restore his youth permanently and that they must bide their time. By the window, Oroku Maji watches and, now knowing the source of Tatsuo’s power, hatches a plan. On the following full moon, Oroku Maji and the Foot Soldiers ambush Tatsuo before he can drink the ooze. Masato keeps the Kitsune at bay while Oroku Maji battles Tatsuo. Oroku Maji slays Tatsuo and vows to restore honor to the Foot Clan. The Kitsune, enraged, tells Oroku Maji that he knows not what he’s done and that Tatsuo shall be avenged. The Present: Splinter tells the Turtles, April and Casey that Oroku Maji fulfilled his promise and led the Foot Clan down a noble path. It was unfortunate, he laments, that his son (Oroku Saki) turned the clan to evil and malice. April once again suggests that they try and get more info from Dr. Miller; a suggestion Splinter and the Turtles support. Casey, though, still has a bad feeling about the guy. At his apartment, Dr. Miller labors over whether he should trust the claim of Oroku Karai, Assistant Director of Oroku Inc. As Miller considers his options (or lack thereof), he fails to notice several Foot Soldiers spying on him through his window. At Foot HQ, Karai tells the Shredder that she believes they’d be better off just killing Dr. Miller before he learns too much. Shredder silences her, saying that he’d rather preserve Miller’s intellect and utilize it for a project he has envisioned. Alopex asks why Dr. Miller’s talents are so valuable and Shredder hints to her that he may be getting close to rediscovering a power long thought lost; a power he wishes to possess. The Past: The Kitsune arrives at a strange, high-tech structure and bows by the entrance. She tells her master that the Foot Clan has been overthrown and she cannot procure what her master desires. However, she swears that their bargain will be honored. From the temple steps the Iron Demon: an Utrom in a lumbering robot body. 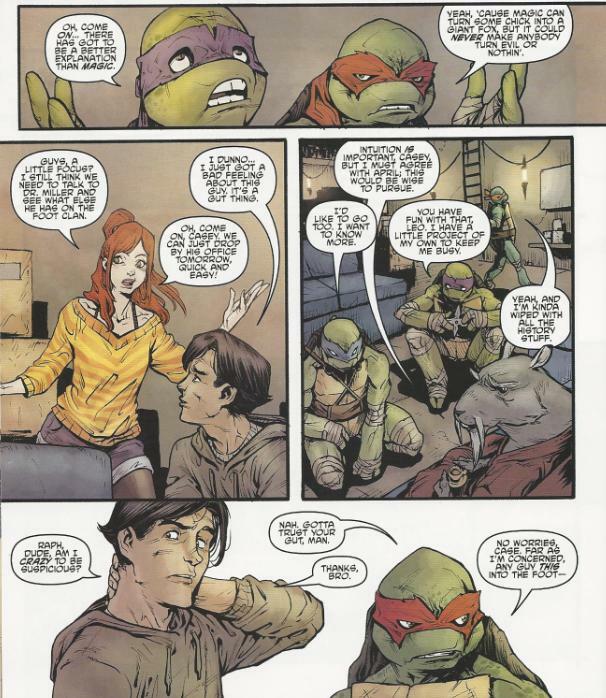 *The story continues in TMNT: The Secret History of the Foot Clan #2. *This miniseries takes place between TMNT (IDW) #20 and TMNT (IDW) #21. 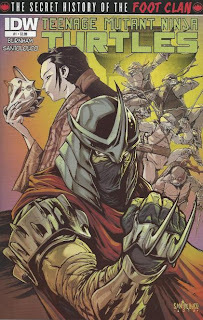 *Looks back into the Feudal Era history of the Foot Clan have been seen previously in TMNT (IDW) #5 and TMNT Microseries #5: Splinter. *This issue was originally published with 8 variant covers: Regular Cover by Santolouco, Cover RIA by Rafael Grampa, Cover RIB by Kevin Eastman and Ian Herring, Rover RE – Hastings by Eastman, Cover RE – Dynamic Forces by Eastman and Herring, Cover RE – Jetpack Comics by Eastman and Herring, Cover RE- Jetpack Comics blank sketch cover, and Cover RE – Jetpack Comics black and white cover. 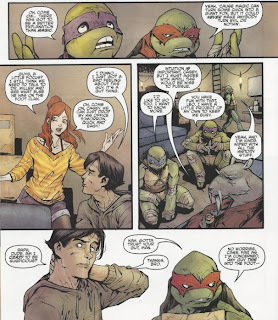 If you go back and read my reviews for IDW’s Ninja Turtles comic, you’ll find that I wasn’t particularly generous or enthused for some of the earliest issues. 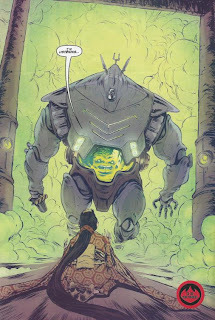 It was TMNT#5 that acted as the turning point; truly drawing me into this fresh incarnation of the TMNT. I loved the ties back to Feudal Era Japan, the sweeping mythology that IDW was forging and, dude, Mateus Santalouco’s art. Holy cow. “Secret History of the Foot Clan” takes us back to the time and place first glimpsed in that issue, filling in narrative gaps both past and present. More than a year later, there are still an armful of questions waiting to be answered and it looks like this mini is the one to finally give them to us. How did Oroku Saki come back from the dead? What’s up with the Foot Clan and Krang being enemies? Is Alopex ever going to do anything interesting? The Foot Clan have had origins dating back to the Feudal Era in nearly every incarnation of the Ninja Turtles. In the Mirage comic, we witnessed their formation in TMNT (Vol. 1) #47. In the Fred Wolf cartoon, we got the back story in “The Legend of Koji”. The 4Kids animated series covered it across the “Secret Origins” multiparter and much of season 5. And in most of those incarnations, the Foot Clan was always depicted as an “honorable” organization up until the Shredder got his greedy mitts on it. So for those put off by all the Feudal Era stuff, it really isn’t anything new to the TMNT universe. Burnham and Santalouco write a really tight script where the jumping back and forth between past and present don’t disorient as much as my summary might imply. The present portions segue into the past portions smoothly and the piecemeal nature of the information being deposited, while it does feel like a tease, is enough to get one hooked. There’s plenty to guess about, such as if Oroku Saki somehow used the mutagen to affect his “survival” across the centuries. And I have a hard time believing that the Kitsune and Alopex just both coincidentally happen to be fox-women, particularly with all the reincarnating going on in this book. When Karai questions Shredder, he gets very short with her, but when Alopex questions him, he’s far more accommodating with his replies. It makes me think that Alopex holds some greater significance than “lame mutant hench-woman”. Then there’s the matter of Krang; or at least I’m assuming that’s Krang. It could be Quanin, Krang’s predecessor as General of the Utrom army. Of course, that archaic-looking “Iron Demon” robot body just screams “Krang”, brandishing so many aesthetic cues lifted from Krang’s old robot body of the ‘80s cartoon. In TMNT #5, Santolouco didn’t get to draw the Turtles, so it was exciting to see his take on them with this issue. He gives them all “unique” bandanas which, well… It prompted flashbacks to Ninja Turtles: The Next Mutation, and flashbacks to Ninja Turtles: The Next Mutation are never a good thing. On the other hand, Santalouco takes a cue from Ross Campbell and draws the bandanas looking like actual fabric resting on their heads and not skintight spandex that magically conforms to their brow’s every minute expression. And Leo’s bandana looked like the Batman logo, which made me laugh. Bandanas aside, his art is really stellar stuff, from the layouts to the details and it feels especially lavish when compared to the competent-but-economical art consistent across the TMNT ongoing. The colorist, Vieira, has a unique interpretation of April that's probably the most “ginger” version of the character I’ve ever seen; she now has pasty white skin and a smattering of freckles to compliment her red hair. It was a very different take on her look and I sort of dug it. As the first issue, we’re only really glimpsing the tip of the iceberg, but “Secret History of the Foot Clan” has gotten off to a furious start. It’s steeped in this universe’s mythology and is doing some heavy duty world-building, so if you’re really into that sort of thing, then I imagine you should find it entrancing. If you’re not so much a fan of back story dumps, well, it’s full of action and it’s beautifully rendered by Santalouco. Something for everyone! Dang, I was sort of hoping they were bringing in Tatsu from the first two movies. Does anyone know WHY the Foot was slaughtering people and burning villages in the name of the Iron Demon? I haven't read the comic, I've just been reading summaries, and it doesn't make any sense right now.